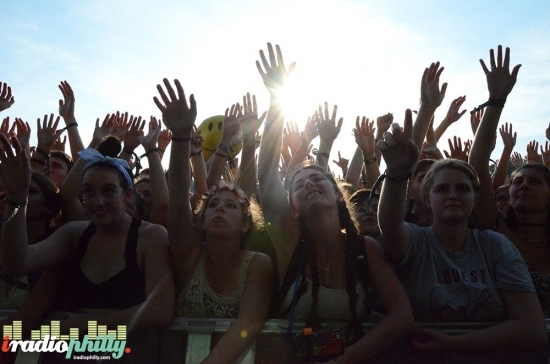 Firefly Music Festival is back in the Woodlands at Dover Downs in the middle of Delaware. This year they officially sold out of passes, that's roughly 90,000 attendees expected throughout the weekend. This year they also did not sell individual day passes, only the full 4-day variety. Music kicked off on Thursday night on a few stages, but Friday was the first full day of activity at the fest and it did not disappoint. The weather was dry in the sky and the clouds hid the sun enough to keep the heat manageable but the grounds are already a bit soggy and muddy. Once those remnants of 'Bill' head this way later this weekend, there's going to be a big mess. All in good festival fun though. There's so much to see you can't see it all so decide to run between stages or camp out in front of one. Philadelphia's Cheerleader played early in the day on the Forest Stage. Those guys were excited to be here and playing in front of new fans. They also did a set later in the day in the enclosed Coffee House tent. First up on the Main Stage today was Manchester Orchestra. Lead singer Andy Hull was belting it out a top that monstrous stage. There was all this extra rigging and equipment on the ground in the front of that stage for tonight's headliner (eh hem, he's a Beatle) and anyone playing there before seemed further away over all this stuff. Shortly after they went on, indie pop Echosmith took the Lawn Stage. They were just in Philly for Taylor Swift's concert at the Linc. She had them come out and play their hit “Cool Kids” in the middle of her show. Crowd favorite, Walk the Moon, was up next on the Lawn Stage. You could see a lot of fans wearing the signature face paints just for them. They brought a ton on energy and playing hits like “Anna Sun” and “Shut Up And Dance.” Now if you want to talk about energy, back over on the Main Stage, Cage the Elephant was ready to go. Remember all the stuff in front of the stage? Well, it didn't stop lead singer Matt Schultz from jumping off the stage and getting in the crowd right away, dragging his microphone cord the whole way. If you've never seen these guys live before they are a blast, always moving, jumping, back and forth. It doesn't hurt that they have a whole string of alternative rock hits. To complete the late afternoon, I headed back to the Lawn Stage for AWOLNATION. Morressey took the Main Stage with a brash confidence and just laid it all out there on the crowd with his performance. He's a showman and a commander. If you are going to be seeing him at the Academy of Music on Saturday night then you are in for a great show. Modest Mouse sounded great. They played the first Firefly in 2012 so it nice to see them back, can't wait for the new album. The main event. Sir Paul McCartney. Many of those 4-day passes were probably bought just to come see him play tonight, we'll see how many people are around tomorrow. A ticket to Firefly was cheaper than to see Paul at Wells Fargo Center on Sunday. There aren't enough superlatives to adequately describe seeing Paul McCartney. Almost every music fan loves the Beatles. We can't see them play live. This is pretty darn close. The setlist is below, look at each of those songs. When he started each song my thought was, “oh my, Paul McCartney is playing this song live for me right now.” Forget that he just turned 73 on Thursday, his age doesn't matter, he moves around the stage like he's 25. He plays bass, guitar, piano, sings. He tells stories. He is having the time of his life. Now for something completely different. EDM maven Zedd was set to take on the Backyard Stage right after Paul. You could barely see his head up in the booth, but he was there. The bass made your organs rattle and the synths screamed and everyone was jumping and dancing. Watch for confetti cannons and glow sticks. To close out the late night on the Forest State was Philadelphia duo Marian Hill.